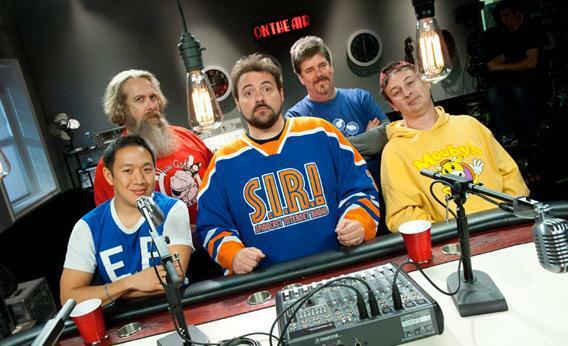 Kevin Smith’s Comic Book Men: Reality TV about geeks. Kevin Smith’s ode to fanboy culture isn’t geeky enough. Comic Book Men (AMC, Sundays at 10 p.m. ET), a reality show about a crew of perfectly nice geeks, boasts competent production values. Thus, it is jarring to see Kevin Smith’s name attached. As Sam Adams wrote in a recent Slate piece, Smith “once said he wasn’t particularly interested in how his films looked.” The director of Clerks and Chasing Amy is, in purely cinematic terms, an auteur without a vision. He does, however, have a point of view. For Smith, the world revolves around geek culture, and his fans in turn orbit his meta-commentary. This weekend offers them a flurry of high-fiving self-mythologizing and one-man-band branding. On Saturday, the cable channel EPIX debuts Kevin Smith Burn in Hell, which is a documentary rendering of a film-festival Q-and-A session. On Sunday, AMC follows, far less feverishly, with the first installment of a six-episode hang session with Smith and his buddies. The series marks another step down the career path that Adams described. All the members of a niche market have been invited to join Smith’s virtual entourage. In recent years, because of novelists like Michael Chabon and Jonathan Lethem, because of the mainstream success of innumerable movies featuring caped crusaders, and because of the excellent work of the heirs of Art Spiegelman, comic-book culture has become respectable. Comic Book Men sometimes proceeds as if its mission is to restore that culture’s bad name. Here we are in New Jersey, within the walls of Jay and Silent Bob’s Secret Stash, the memorabilia shop Smith runs in the town of Red Bank. Here, there be dudes. At one point, a peroxide blonde crosses the threshold in an attempt to sell a Chucky doll, but the Secret Stash is primarily a male preserve and, more importantly, a refuge—a fanboy man-cave. The Secret Stash crew includes a manager named Walt (perpetually shrugging beneath his New Jersey Devils cap), an underling named Ming (mercilessly teased), and a patron named Bryan (a Smith regular distinguished by a beard that looks make him look like Billy Gibbons disguised as a walrus). At some points, they make a mock-Apprentice show of competing to sell Star Trek plates and Bart Simpson dolls at a flea market. At other points, they suffer to enact routines modeled after Pawn Stars or Antiques Roadshow. Folks come in with Bob Kane drawings and Steve Austin figurines, and the geeks assess the value of these items, admiring them with all due hyperbole. (Seeing the Bob Kane sketch is “like finding a signature of George Washington.”) The soundtrack emits its dull ka-ching. A regular device finds our geeks hunched into the mics at Smith’s podcasting studio, a venue where, for instance, they parse the episode of The Six Million Dollar Man where Steve Austin battles a bionic Bigfoot. This is where Comic Book Men fails on its own terms. These gentlemen are clearly capable of talking about such matters in terms suitable for a Ph.D. oral examination administered by Tarantino, but the show gives us mere word-bubble quips. For instance, a discussion of the guys’ favorite horror movies only skims the bloody surface. Smith’s thoughts on The Shining? When the weird sisters turn up, “still, to this day, when that moment happens, I wet myself.” Likewise, a discussion of the hottest superheroines—Catwoman? Caitlin Fairchild? Zatanna?—felt sadly truncated and not nearly creepy enough. The illustrated title sequence of Comic Book Men depicts these guys as musclemen in tights, but the scenes that follow are strictly mild-mannered. These are a fan’s notes to self.